There are few things in life that are more gut-wrenching than walking with a loved one through a terminal illness. 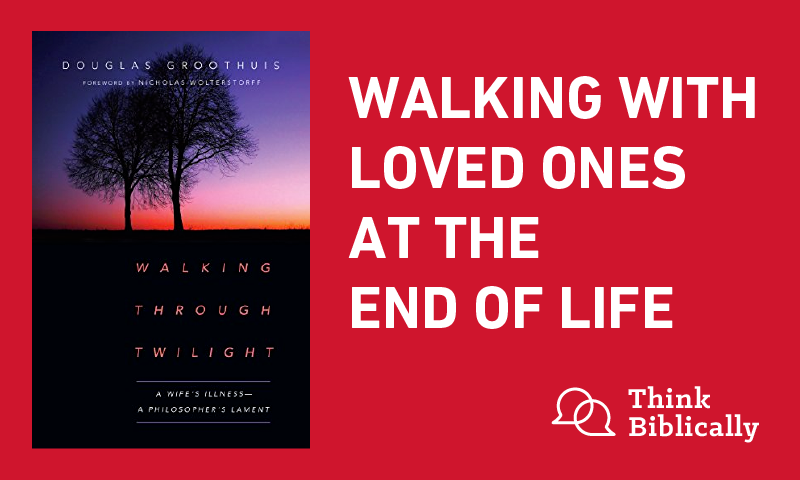 In this heart-rending interview, Scott and Sean talk with Christian philosopher Dr. Doug Groothuis, as he recounts his decade long journey with his wife, Becky, through terminal dementia, in his new book, Walking Through Twilight: A Wife’s Illness-A Philosopher’s Lament. 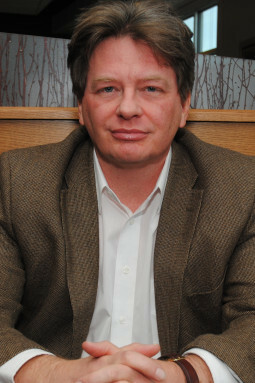 Dr. Doug Groothuis is Professor of Philosophy at Denver Seminary and the author of numerous books and articles on philosophy and apologetics. His most recent book, Walking Through Twilight, is featured on this podcast. Scott Rae: Welcome to the podcast, “Think Biblically: Conversations on Faith and Culture.” I'm Scott Rae, your host, dean of faculty and professor of Christian ethics here at Talbot School of Theology at Biola University. Scott Rae: We're here today with our good friend and fellow faculty colleague at Denver Seminary, Doug Groothuis. Doug is professor of apologetics and philosophy at Denver Seminary, but the book we're going to talk about today is his newest book, which has, actually, very little to do with what, Doug, what you've typically written about over the years in apologetics and philosophy. The book is called Walking Through Twilight: A Wife's Illness — A Philosopher's Lament. So Doug, welcome to our podcast, thanks so much for coming on with us, and for talking about a book that, really, is quite different than a lot of what you've written on traditionally. Doug Groothuis: Yes, well, thank you for having me. Scott Rae: Sure. Why don't we start, if you wouldn't mind, just sharing the ... you know, behind every book is a story, and what's ... tell us a little bit about what prompted the writing of this book, and what's transpired since it was published about this time last year? Doug Groothuis: Right. Well, the book is about my journey with my wife, Rebecca, who has since passed away, through dementia. She was diagnosed about four and a half years ago with a rare form of dementia called primary progressive aphasia. She had been ill for many years, and I believe she had this disease before she was diagnosed, and I was doing my best to care for her and keep teaching full time. And an editor asked me if I would write an article about it — it was Mark Galli at Christianity Today — and I said, “Probably not, but I'll think about it.” And then I very quickly wrote an article on that situation, and I've never gotten more responses to anything I've written in 35 years. So, several publishers contacted me about writing a book, and I went with InterVarsity, my longtime faithful publisher of most of my books. I wanted to write a lament that would help people learn how to lament, how to bare their hearts before God, and take all the emotions, the confusion, anger, the sorrow. And so, I speak about lament, I look at Psalm 90, which is a psalm of lament by Moses, but most of the book is telling our story, and then reflecting on that story philosophically and theologically. You'll find a lot of Scripture in the book, particularly wisdom literature from the Hebrew Bible. Scott Rae: Doug, you know, we've been friends for a long time, and we've been Facebook friends, actually, for I think about as long as Facebook's been available, and I followed a lot of Becky's illness and decline, and your reactions to that, via your various Facebook posts, and I know you did a lot of posting on Twitter. I'm really interested ... I think our listeners would be interested to know some of the reasons why those two platforms ended up being as influential as they were as places to process some of the pain and grief that you were dealing with as Becky declined. Doug Groothuis: I certainly have my friends, my face-to-face friends, and of course my church, which I love, but I certainly needed prayer, as did Becky, as we walked through this very arduous and painful decline. And I had a sense from the Lord that if I shared some of what I was going through, and reflected on it, that it might encourage other people, and also that it would help me and Becky, because of the prayer, and then also because of the words of encouragement that I received from people. I received such a large response that I decided it was a good idea to keep communicating those things through that medium. A lot of people, many people, have thanked me for being transparent about this, and I guess the best thing a writer could hear, besides, “You have a book contract,” is, “You put words to what I felt, but I couldn't say,” and I've had a number of people tell me that, and it's very gratifying. Sean McDowell: Would you recommend other people to grieve that way? Or what would your suggestions be when other people enter into different kinds of just pain and hurt in terms of those different mediums? Doug Groothuis: Right. I think it depends on the person and the situation. I'm a writer, so I think about every situation in words, and it's fairly easy for me to communicate these things in prose and bad poetry, as I did on Facebook. Some people are not really gifted that way from the Lord, so they might not want to put up that much material, or bare their soul that much. I think it varies, and of course Facebook is a dangerous place. There are predators out there. But it seemed to work pretty well for me. I didn't have too many mean-spirited people. I had a few moments of unsolicited advice I didn't appreciate. I had one fellow — God bless him — who just was trying to cheer everybody up all the time, and that wasn't the time for it. There's a time to mourn, and I eventually had to unfriend him, because he was challenging my friends who were lamenting with me. But all in all it was a blessed experience. I'm not sure it's the right ... it's not the right thing for everybody. It might be helpful, but it should be secondary. Primary should be your family, friends and church. Sean McDowell: I think that's a great perspective. I found it interesting that you titled your book Walking Through Twilight, instead of walking through darkness, especially because, in the book, you talk about times that it really felt like you were in darkness. So, why did you choose to title it Walking Through Twilight? Doug Groothuis: My original title had the word darkness in it, and I realized that no, darkness is the very end, and then after that end of this earthly life is light. Becky is now in the world of perfect light with her Lord and all the saints. So, I thought twilight made sense, because the light of her intellect, and the light of her personality, was dimming, and actually fragmenting in some ways. But we were walking through it together, and we're walking through it with the Lord. So, that's why I used the word twilight, getting darker and darker until it's completely dark, but then there's a sunrise. There's dawn following the darkness. So, I work with those themes a little bit. Sean McDowell: So, there's dawn following the sunrise, as you describe, but what gives you the confidence of that, because I thought ... it was really interesting in the book that you said this process, at times, made you question God's goodness, but not his existence. Talk about that, if you will. Doug Groothuis: Yes, I'm very convinced that there are tremendous reasons to believe in a creator, designer, moral law giver, God, as well as believing that he sent his only Son to atone for our sins. And both of you know that I wrote a ridiculously long apologetics book called Christian Apologetics some years ago, and that book's not perfect, but I believe the arguments. So, I know God is there, but it feels, sometimes, that he's abandoned you, or you're very angry with God, and those of us who have felt that are in good company, because we have the many psalms of lament, perhaps 60 different psalms of lament in the Old Testament, and they can be pretty raw. God, why have you abandoned us? Why don't you hear us? How long, oh Lord? And so on. And so, that is a model of prayer, and a model of being, that actually works within the framework of the Christian worldview, not against it. But there were some extreme times of confusion, anger, and I let God know how I felt about it, and I don't encourage that, but I do know that Christ is a forgiving savior, and he does not give up on us through that. So, here I'd say apologetics is crucial to grieving for the Christian, because you're held fast that you know this is true, as well as, of course, your personal experience of being with the Lord. And I've been a Christian now for over 42 years, so I couldn't deny all the ways I've seen God work in and through me, and through other people. Simply because my world was falling apart, it didn't mean that God was falling apart. Scott Rae: Doug, you've talked about, both in the book and just in these first few minutes, that a significant part of the process of grieving had to do with lamenting, and learning to lament well. And I think you're right, a lot of the lament in the Scripture is very raw. One of my favorite books on lament in the Scripture is entitled, Nobody Says Please in the Psalms, and I think it sort of captures a bit of that. But I also know it's possible to lament well, and it's also possible to lament badly. How would you help our listeners distinguish between those two? Doug Groothuis: Lamenting well is offering yourself to God, and with God's people, when you can, and keeping the lines of communication open, not turning your back, not walking away. Even if you're yelling at God, I think that's better than hiding from God. And of course, you can lament poorly by escaping, trying to escape God because you're so angry or disappointed. And then, because the situation is so deeply painful, people may turn towards the darkness just to anesthetize themselves in terms of addictions and obsessions, or deserting their post. I am so saddened of hearing how spouses will often divorce their husband or wife because that person has dementia, or that person has an incurable illness. And that's a bad way to lament. That's actually trying to escape your responsibility before God. Scott Rae: Now, let's take this a step further, too. You know, the church that I go to I suspect is, Sean, maybe a bit like yours and others. We don't talk about lament very much. We just don't ... You know, that's just not something we do in a lot of our churches. What suggestions would you have for pastors, or for church leaders, that we can do in our churches to help people lament well as opposed to just not grieving at all about some of these things? Doug Groothuis: Right, and that's the American way, it's to get over it and move on, but that doesn't do justice to the loss. You don't get over it and move on when you lose your wife to a slow, debilitating disease, or when you lose your son to a car accident. It's actually healthy, and morally right, to lament that. I think by teaching the psalms of lament, perhaps by going through the book of Ecclesiastes, which is not technically a lament, but it does give you wisdom for living amidst a world of disappointments and ephemerality, where things seem to slip through your fingers so easily. And I think I could also make a case for observing the church year, because we have a season — church I go to, Wellspring Anglican Church — of Lent. So, that's a time of personal reflection, and renouncing certain things, giving up some things for a time, lamenting over your own sins, and perhaps sin in general. So, I think that liturgical aspect is very significant. When we take the Lord's Supper, also, we remember his death, and we remember the meaning of his resurrection, so we have that death and life combined in the Eucharist, or the Lord's Supper. I think there are a lot of ways to do this. There could be a special service of lament. One of my students, a worship pastor, Zac Hicks, who's written an excellent book called The Worship Pastor, designed a service of lament in a church he was serving some years ago. Scott Rae: Those are some [inaudible] very helpful, really practical things, and I especially like the way you set this in context with the way we do this culturally, sort of get over it and move on. I'd like to think that when the day comes that I go home to be with the Lord, the people I care about the most won't just get over it and move on quickly. Scott Rae: I'd like to think that somebody would grieve my passing in ways that would be meaningful and healthy and helpful. Doug Groothuis: Right. Well, it's interesting that Ecclesiastes says, “The day of death is better than the day of birth,” and, “It's better to go into the house of sadness than the house of laughter.” And the idea there is that we should take heart that it's a fallen world, that death is a part of this world until God renews all things through Christ. So there's a place for attending a funeral. There's a place of visiting someone who is losing their mind, who is deeply debilitated. So there's a place to recognize real value when it's lost, or when it's ebbing away. And if you pretend like it's nothing, then you never realize the true worth that God gave it to begin with. Scott Rae: Now, and I suspect that that ... you know, the way someone grieves over a loss like that will have a lot to do with the degree of connection that the person had with their loved one during their life. So, to simply to suggest that they move on I think actually cheapens the depth of relationship that you have with the people who are most important to you. Let me ask you one other thing on this to push this a little bit further. You know, you're ... you went through a long period of walking with Becky through this progressive illness. You're now on the other side of that. She's home with the Lord. What advice would you have for some of our listeners who might be where you were three or four years ago, when you're right in the thick of walking with someone who's got this kind of progressive dementia? Doug Groothuis: Right. Stay in the Scriptures, and find those scriptural themes, those truths about God, that are pertinent to that situation. One of them is when Jesus said, “As you serve the least of these, so you serve me,” Matthew 25. So, as you're serving someone who's declining, and who is difficult, think of serving the Lord. And then I think, also, consider the future. I encouraged Becky very often with texts from Scripture, Revelation 21, 22, texts from Paul where he talks about it being better to leave this life and be with the Lord, and so on. So, find those themes that are constant, because with dementia, and any kind of progressive, fatal disease, things keep changing, and it can be unnerving. It can be a dizzying experience, because you have to keep increasing the care and changing the situation. So, we need a rock. We need something that doesn't change. And then also we need respite. That's a term I'd never thought much about, really, but in this area of care for the dying and the chronically ill, respite is extremely significant for the caregivers, because it's very easy to become sick and depressed when you're giving care all the time if you're not getting respite. Respite means get away for a week. Spend time with relatives. Mini-respites. For me it was often a good jazz concert with my friends, and when someone's playing a fantastic saxophone solo, I'm not thinking about all the woes in the world. And that's not an escape from responsibility, that's simply entering into another aspect of creation that is wonderful, that is joyful, that has nothing to do with decline, and death, and sorrow, for that moment anyway. Sean McDowell: Doug, you mentioned earlier your book, Christian Apologetics, and by the way, I've taken two different groups of high school students, about 10 or 12 of them, through most of your books, so it is one of the best intermediate apologetics texts that's out there. Sean McDowell: But you probably wrote most, if not all, of that before this process with Becky began. What have you learned about yourself, about your theology? Did it change? Did it deepen as you went through this period in your life? Doug Groothuis: That's a good question. Becky had been chronically ill before she was diagnosed with dementia, and I'm not sure how long she had the dementia. So, that was a part of our lives for quite some time, that kind of protracted suffering. And in fact, Becky edited all my books through Christian Apologetics, that was the last book of mine that she edited, and now I've done ... how many? Two since then. And I missed her, because we were a team, a writing and editing team. And she wrote two books, and edited an academic book as well. What has changed in my theology? I guess, given how angry I had been with God, and how hopeless I felt, I have to bank on God's unconditional acceptance of me, and his persistence, his faithfulness. That, I think, has deepened. But it's been a rocky road, there's no question. It hasn't been a serene journey. I'm starting to feel much more rested, and much more relieved. I think God's opening up a new season of my life of enjoyment and rest, and I'm really grateful for that. And God has begun a new chapter for Becky, which is far better than mine. Doug Groothuis: I think so. Sean McDowell: ... for sure. Doug Groothuis: One other thing is that I think God's been developing sympathy and empathy in me for quite some time, a gift of encouragement, and comfort, and so on. But through this I am very aware of people who are suffering and struggling. One of my students said that when I go into a room, I tend to scan it to see if anyone is in distress, that I might help them. And that just happened organically. I didn't read a book on how to do that. I think it was suffering with, and suffering through, all this with Becky. I'm more aware of suffering, and less willing to turn away from it. I'm kind of a sap, you know, I get sad when I see roadkill, so ... but I'm trying to be a godly sap, you know? Doug Groothuis: Well, I think two categories, metaphysics and morality, we reflect on the being of God. He's self-existent. He's all-knowing, all-powerful, omnipresent. He is in a far better position to run the universe than we are. And then the moral situation really comes back to Christ, that how do we know God is good? We have the moral argument, which I think is powerful. I have a chapter on that in Christian Apologetics. But I think the greatest demonstration is the person and work of Jesus Christ. Doug Groothuis: God so loved the world he sent his Son to suffer and die for us, and he rose again from the dead. So, we have hope looking ahead. It's a difficult journey, but if that's fixed in your mind, that there's more to come, and it's glorious, then it makes all the difference. Paul says that we don't grieve as the world grieves, but we do grieve, and we need to let ourselves grieve, and then also let other people grieve, and gently remind them of the promises of God, and the character of God, when the world seems to be topsy-turvy, just falling apart, and you panic. I think that's one of the hardest emotions I had to face was panic. I have no idea what to do right now. But those moments passed, and one of my prayers, earnest prayers, is that we could keep Becky at home through the whole process, and that she could pass away at home, and she did. I was at her side, and her younger brother, John, was at her side. And even our beloved dog, who I talk about in the book, Sunny, was in the room at the time. So, I'm grateful to the Lord that he gave us that mercy, and I don't know why he didn't give us certain other mercies, but he's God and I'm not. Scott Rae: Doug, I think one of the questions that sort of screams out at people when they go through things like this is sort of the, you know, why her? And why us? Talk a little bit about how you process that, and how you think about that. Doug Groothuis: A lot of my help in this came from decades of reading and reflecting on Ecclesiastes in the Old Testament, because the teacher there ponders the unfairness and the temporality of life, and he never forgets the reality of God, that we live before the face of God. God will bring all things into account. But he cannot figure out a lot of things, and he gives up. So, I think I have a chapter in the book called Giving Up, and when Becky got the diagnosis of primary progressive aphasia, at that point, and I think God was leading me, I gave up on her being healed, because we had sought healing for so many years, so many different types of medicine, alternative medicine, doctors, and so on. So, you know, there's a time to give up, and there's a time to say I don't know why, and I won't know why in this life. And so, it's not so much why, but what now? And, of course, I'm a philosopher, so I like to know things, you know? I like to have justified, true beliefs about everything that matters, but in this case I have the knowledge of God, by his grace, I think I have a coherent, consistent, livable worldview. But within that worldview there are pockets of mystery that I cannot unlock. So, I think that helped me tremendously, because I find people, sometimes, with good intentions, trying to read the mind of God. But I learned a long time ago that while good comes out of evil, there are some evils that are so terrible you can't imagine any earthly compensation, you really have to put that into the afterlife. Scott Rae: I appreciate those reflections, Doug. I mean, I too have been impacted by reading Ecclesiastes on this, and how Solomon there sort of regularly encourages his readers to stop trying to unscrew the inscrutable and realize that, you know, that's ... this side of eternity there are just lots of things that we are not going to have answers to. But we do get the assurance, and this is, I think, the assurance of Job, even though he didn't get answers to any of the questions that he had raised about what happened to him, he did ... God instead gave him his presence. And so, just as a last question for you, how did you experience God's presence with you during these times? Doug Groothuis: Well, I have to be honest and say that it wasn't a constant awareness of God's presence. I think a lot of it had to do with how God would bring things together to care for Becky. We had three different caregivers, and each one was right for the level of debility she was experiencing. And even though it was a terrible process, and Becky was deeply upset, just devastated by it, somehow I felt like God was carrying me along. It's hard to put into words. It was, this is terrible, I don't know that I'm doing a very good job, but somehow I'm not completely falling apart. Somehow, Becky's getting the care, medical and spiritual. That's about the best way I'd put it. I didn't have any great epiphanies of God's peace, really, but a sense of his guidance is the way I would put it. My sainted grandmother talked about my guiding hand, so I had that awareness of God guiding, at least most of the time. There are some times I had no idea what was going on, and it was a panic situation, but God got me through that, too, got us through that. Doug Groothuis: ... I think is important? Through this whole journey through twilight, my church was very supportive, and someone would bring communion to Becky just about every week for about two or three years, and that was a sacred time. Scott Rae: Yeah, well that's terrific. Doug Groothuis: Yeah, we counted on that. And Becky could still sing pretty much until the end, or at least she could hum, and folks would come over and sing gospel songs, and sing hymns with her. So, you don't want to lament alone. You want to have the resources of the church and friends, friends who can understand and weep with those who weep, and then, at some point, laugh with those who laugh, but it's not always a time to laugh. Scott Rae: Right, right. Well, Doug, we so appreciate you, your vulnerability, and your just willingness to share your heart with our listeners here, which you've done in your book, and through the Facebook, and Twitter, and the social media ways in which you've done that as well. We want to encourage all our listeners, this is a great book that he's done called Walking Through Twilight, subtitled A Wife's Illness — A Philosopher's Lament. It's a great book, InterVarsity Press. Doug, thanks so much for writing this and for coming on with us today. Doug Groothuis: Great. Well, thanks to both of you. Scott Rae: This has been an episode of the podcast “Think Biblically: Conversations on Faith and Culture.” To learn more about us and today's guest, Dr. Doug Groothuis, and to find more episodes, go to biola.edu/thinkbiblically. That's Biola dot E-D-U forward slash Think Biblically. If you enjoyed today's conversation, give us a rating on your podcast app and share it with a friend. Thanks so much for listening, and remember, think biblically about everything.